Blackpool have signed Scotland Under-21 midfielder Barry Bannan on loan from Aston Villa until 30 January. The 19-year-old has previous experience in the Championship having made 10 appearances for Derby last season. 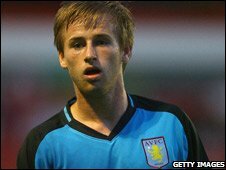 Bannan made his senior debut in Villa's UEFA Cup defeat by German side Hamburg in December 2008 after coming on as a second-half substitute. He went on to make his full debut in the same competition against CSKA Moscow of Russia in February.